UPDATE! Contest: Get away to VMworld with Gestalt IT / Pay it forward! Some of you may have already read about the contest over at the Gestalt IT website, but I thought this contest was nice enough to give you an overview here and link back to the contest. the annual VMworld gathering in San Francisco has become the central event for virtualization-related companies. Although focused on VMware, the conference draws many companies. And the labs and sessions are really awesome! One roundtrip air ticket from one of the major airports near you to SFO or another airport in the San Francisco area. Three nights at a hotel within 1 mile of the Moscone Center in San Francisco (VMworld runs August 30 through September 2). Now the final question would be what you need to do to enter, right? Well, we decided that VMworld was created for the community of VMware customers, users and partners. So, what we want to know from you is what you will do for our and/or your community by attending VMworld. Will you take notes from sessions and try to help people back home? Are you going to try and get some video interviews that will answer the burning questions your community may have? We want to know how you plan on “paying it forward”! So, what are you waiting for? Get on over to the contest page to read all of the details and to enter the contest. We look forward to seeing your entries! I received word that the contest has been extended. The winners will be announced Friday, August 13th. Yes, you read that right, winners. We were lucky enough to find some additional sponsors, which means that we will now give away two trips to VMworld. Check out the details here! Also, a special thank you to Symantec and Xsigo for their help as a sponsor. And a thank you to two wonderful additional sponsors, Zetta and Veeam, that made it possible to pick two winners. As some of you might have read, the stack wars have started. One of the bigger coalitions announced in November 2009 was that between VMware, Cisco and EMC, aptly named VCE. Hitachi Data Systems announced something similar and partnered up with Microsoft, but left everyone puzzled about the partner that will be providing the networking technology in it’s stack. Companies like IBM have been able to provide customers with a complete solution stack for some time now, and IBM will be sure to tell it’s customers that they did so and offered the management tools in form of anything branded Tivoli. To me, IBM’s main weakness is not so much the stack that they offer, as the sheer number of solutions and the lack of one tool to manage it all, let alone getting an overview of all possible combinations. So, what is this thing called the stack? Until now, we have usually seen a standardized form of hardware, including storage and connectivity. Vendors mix that up with one or multiple management tools and tend to target some form of virtualization. Finally a service offering is included to allow the customer to get service and support from one source. This strategy has it’s advantages. Compatibility is one of my favorite ones. You no longer need to work trough compatibility guides that are 1400 pages long and will burn you for installing a firmware version that was just one digit off and is now no longer supported in combination with one of your favorite storage arrays. You no longer have to juggle different release notes from your business warehouse provider, your hardware provider, your storage and network provider, your operating system and tomorrow’s weather forecast. Trying to find the lowest common denominator through all of this is still something magical. It’s actually a form of dark magic that usually means working long hours to find out if your configuration is even supported by all the vendors you are dealing with. This is no longer the case with these stacks. Usually they are purpose or workload built and you have one central source where you get your support from. This source will tell you that you need at least firmware version X.Y on these parts to be eligible for support and you are pretty much set after that. And because you are working with a federated solution and received management tools for the entire stack, your admins can pretty much manage everything from this one console or GUI and be done with it. Or, if you don’t want to that you can use the service offering and have it done for you. Yes, but things get more complicated from here on. For one there is one major problem, and that is flexibility. 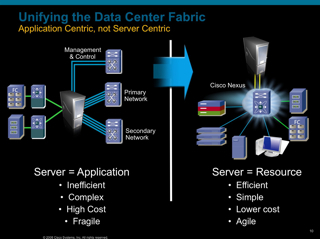 One of the bigger concerns came up during the Gestalt IT tech field day vBlock session at Cisco. With the vBlock, I have a fixed configuration and it will run smoothly and within certain performance boundaries as long as I stick to the specifications. In the case of a vBlock this was a quite obvious example, where if I add more RAM to a server blade then is specified, I no longer have a vBlock and basically no longer have those advantages previously stated. Solution stacks force me to think about the future. I might be a Oracle shop now as far as my database goes. And Oracle will run fine on newly purchased stack. But what if I want to switch to Microsoft SQL Server in 3 years, because Mr. Ellison decided that he needs a new yacht and I no longer want to use Oracle? Is my stack also certified to run a different SQL server or am I no longer within my stack boundaries and lost my single service source or the guaranteed workload it could hold? What about updates for features that are important to me as a single customer? Or what about the fact that these solution stacks work great for new landscapes, or in a highly homogeneous environment? But what about those other Cisco switches that I would love to manage from the tools that are offered within my vBlock, but are outside of the vBlock scope, even if they are the same models? What about something simple as a “stack lock-in”? I don’t really have a vendor lock-in since only very few companies have the option of offering everything first hand. Microsoft doesn’t make server blades, Cisco doesn’t make SAN storage and that list goes on and on. But with my choice of stack, I am now locked in to a set of vendors, and I certainly have some tools to migrate in to that stack, but migrating out is an entirely different story. The trend is the stack, it’s as simple as that. But for how long? We can see the trend clearly. Every vendor seems to be working on a stack offering. I’m still missing Fujitsu as a big hardware vendor in this area, but I am absolutely certain we will see something coming from them. Smaller companies will probably offer part of their portfolio under some sort of OEM license or perhaps features will just be re-branded. And if they are successful enough, they will most likely be swallowed by the bigger vendors at some point. But as with all in the IT, this is just a trend. Anyone who has been in the business longer than me can probably confirm this. We’ve seen a start with centralized systems, then moving towards a de-centralized environment. Now we are on the move again, centralizing everything. I’m actually much more interested to see how long this trend will continue. I’m am certain that we will be seeing some more companies offer a complete solution stack, or joining in coalitions to offer said stack. I still think that Oracle was one of the first that pointed in this direction, but they were not the first to offer the complete stack. So, how do you think this is going to continue? Do you agree with us? What companies do you think are likely to be swallowed, or will we see more coalitions from smaller companies? What are your takes on the advantages and disadvantages? I’m curious to hear your take on this so let me know. I’m looking forward to what you have to say! In November 2009, Data Robotics Inc. released two new products, the Drobo S and the Drobo Elite. Yesterday I was lucky enough to be invited to a closed session with the folks from Data Robotics as they had some interesting news about a new product they are announcing today called the Drobo FS. When we visited the Data Robotics premises with the entire Tech Field Day crew last November, one of the biggest gripes about the Drobo was that it relied on the Drobo Share to allow an ethernet connection to the storage presented from my Drobo. The newly introduced Drobo S added an eSATA port, but also didn’t solve this limitation since it wasn’t even compatible to the Drobo Share. As such the Drobo Share was not the worst solution ever, be it for the fact that it connects to the Drobo via a USB 2.0 connection, thus limiting the maximum speed one could achieve when accessing the disks. Well, that part changes today with the introduction of the Drobo FS. Basically this model offers the same amount of drives as the Drobo S, namely a maximum of 5, and exchanges the eSATA port for a gigabit ethernet port. The folks from Data Robotics said that this would mean that you will see an estimated 4x performance improvement when comparing the Drobo FS to the Drobo Share, and you also get the option of single or dual drive redundancy to ensure that no data is lost when one or two drives fail. 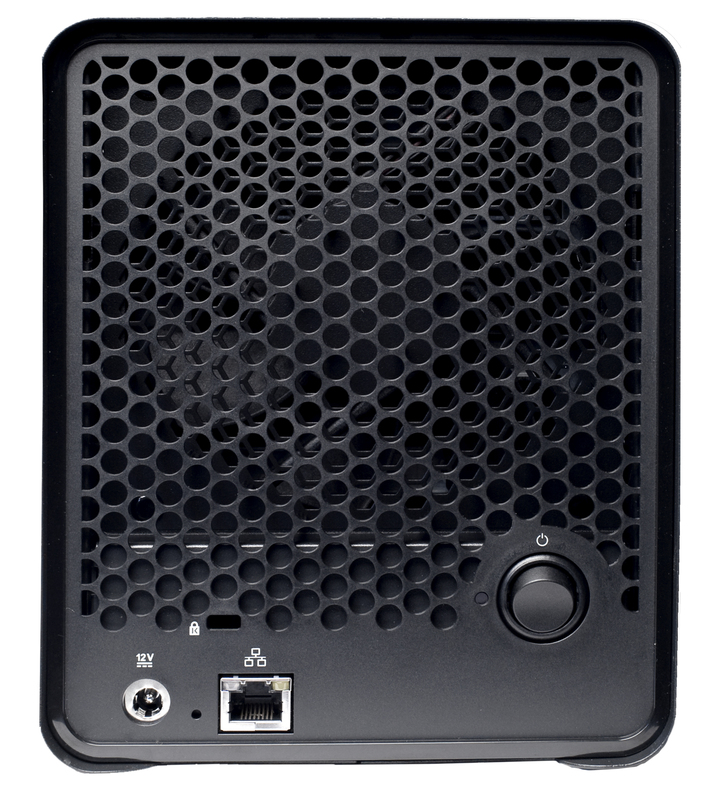 Included with all configurations you will receive a CAT 6 ethernet cable, an external power supply (100v-240v) with a fitting power cord for your region, a user guide and quick start card ( in print) and a Drobo resource CD with the Drobo Dashboard application, help files, and electronic documentation. The only thing that will change, depending on your configuration, is the amount of drives that are included with the Drobo FS. You can order the enclosure without any drives at all, this would set you back $699.- (€519,- / £469,-), or you can get the version that includes a total of 10 terabyte of disk space for a total of $1499.- (€1079,- / £969,-). 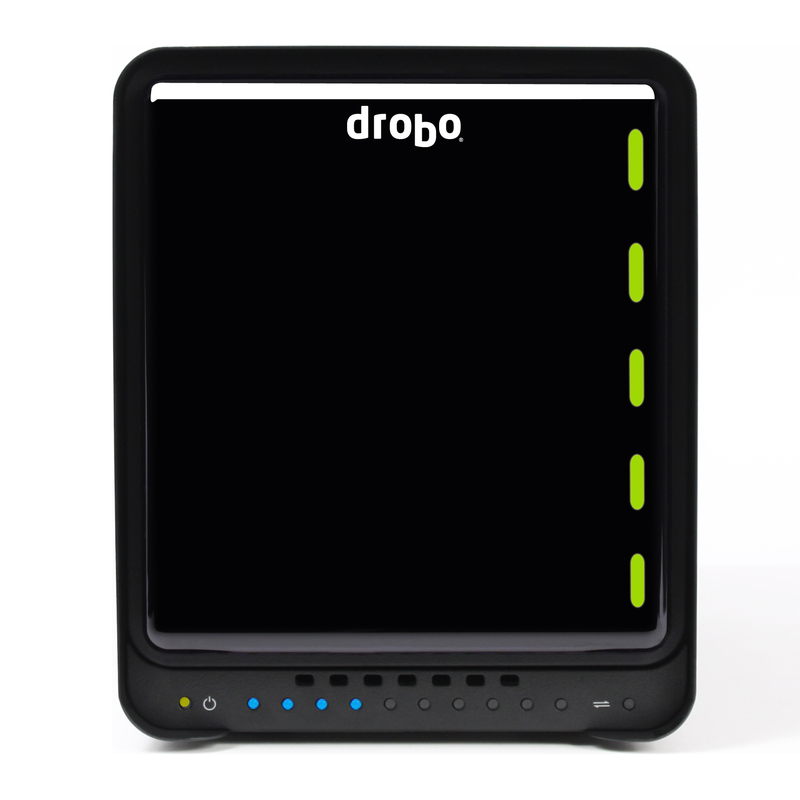 As with the other Drobo’s you are able to enhance the function of your Drobo with the so called DroboApps. This option will for example allow you to extend the two default protocols (CIFS/SMB and AFP) with additional ones such as NFS. Unfortunately we won’t be seeing iSCSI on this model since according to the guys from Data Robotics they are aiming more towards a file level solution than a block level solution. One of the newer applications on the Drobo FS is something that caught my eye. This application is targeted towards the private cloud and uses “Oxygen Cloud” as a service provider to provide file access to a shared storage. This means that you can link your Drobo’s together (up to a current limit of 256 Drobo units) and allow these to share their files and shares. This will include options like access control and even features such as remote wipe, but a more complete feature list will follow today’s release. One feature that was requested by some users hasn’t made it yet. The Drobo dashboard which is used to control the Drobo is still an application that needs to be installed, but Data Robotics is looking at the option of changing this in to something that might be controlled via a browser based interface. However no comments were made regarding a possible release date for such a web interface. What is also under development on is an SDK that will allow the creation of custom DroboApps. Again, a release date was not mentioned in the call. I will try to get my hands on a review unit and post some tests once I have the chance. Also, I am looking forward to finding out more about the device when I meet the Drobo folks in person later this week during the Gestalt IT Tech Field Days in Boston, so keep your eye on this space for more to come.